Christmas is the best time to spread the love and joy everywhere we go. The digital world has taken over our lives and Christmas cards and greetings are now sent online. Still, others still take the classic option by sending cards and mail them to their loved ones. Even the kids share their lovely voices by singing Christmas carols and spreading the message of Christmas. A group called Prunty Farms decided to do something different. The thought of a unique way to send their holiday cheers and joy to other people. 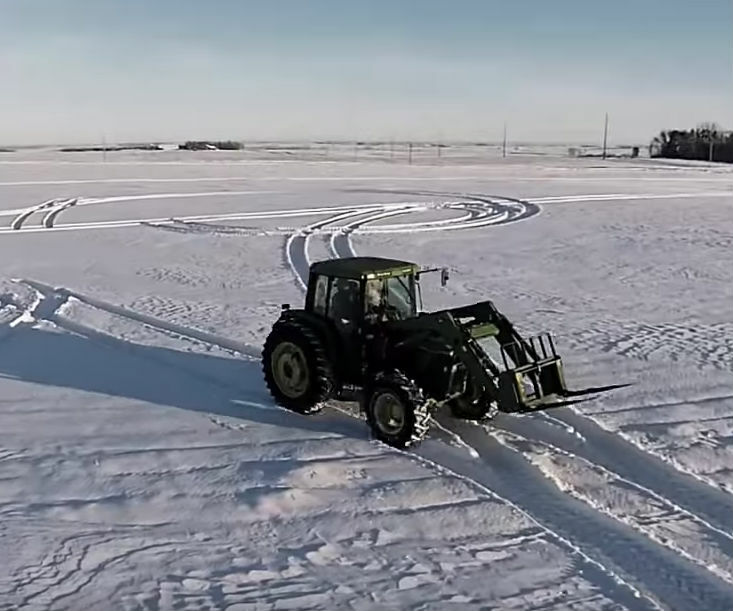 One of the farmers hopped into his tractor when ten inches of snow covered their field. He started it off to begin on his Christmas mission! Prunty Farms is a fifth generation family farm located in South Dakota. Their primary products are soybeans, corn, and alfalfa, but they also raise beef and cattle. The group wants to promote farming and agriculture and they even have a YouTube channel to spread fun and educational family-friendly videos. One of their most popular ones is their Christmas greeting through a snow art. One of their farmers named Dan planned to imprint a message in the snow and this is his only chance! He would not be able to go back and fix the snow to make it look fresh again because this would already be pushed down. Still, the other people from the Prunty Farms believed that Dan would be able to do it. As he started for the field, the others sent a camera to the sky to capture every moment for all the world to see. Dan started to drive through the vast field while his partner films what he’s doing. Even though he would not be able to see his work, he has faith that the spirit of Christmas would guide him. Dan plans to drive around the two acres of land while the drone films as this magical moment unfold. Nobody would be able to see the results until its done but everyone is hopeful. All they were praying for is that this would please the people in their community. However, it did more than just that. Dan’s creation became a viral sensation! Those who have seen the video were amazed by what these farmers did. Christmas is the time for giving. But this does not mean that we can only give material things. Farmers are some of the most important people in our agriculture industry and sometimes, their voices are often forgotten. To be heard, they have learned to use their land to speak to the world. Seeing an effort as huge as this makes us feel the real meaning of Christmas. Who would have thought that something as epic as this can be possible? 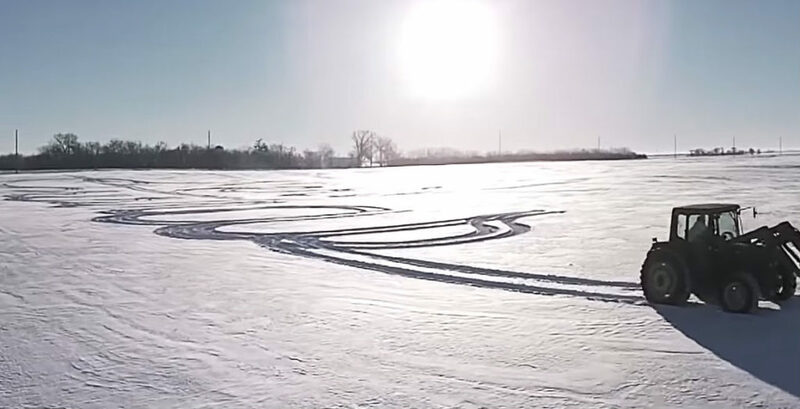 This snow art became viral and the farmers were not only able to spread their Christmas greetings to the entire community, but also to the rest of the world! Dance-offs are usually the stuff of movies, but once in a while, a real-life dance duel breaks out. This example happened to break out at a mall and involved a teenager… and a very unlikely competitor. 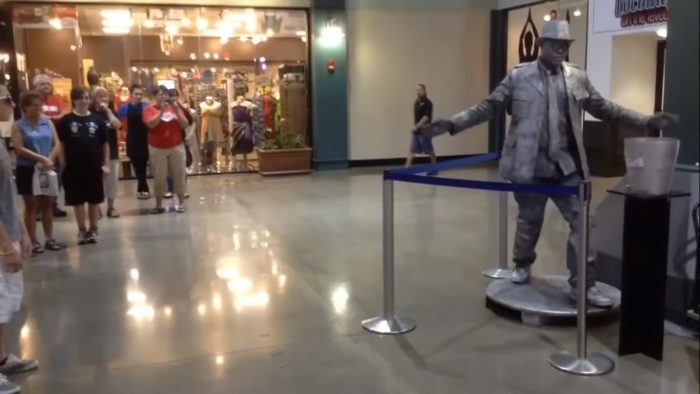 YouTuber Noster, aka Noah Kenaley, faced off with a human statue. If you’re unfamiliar with the human statue concept, it’s an art form in which a person commits to impersonating a statue. 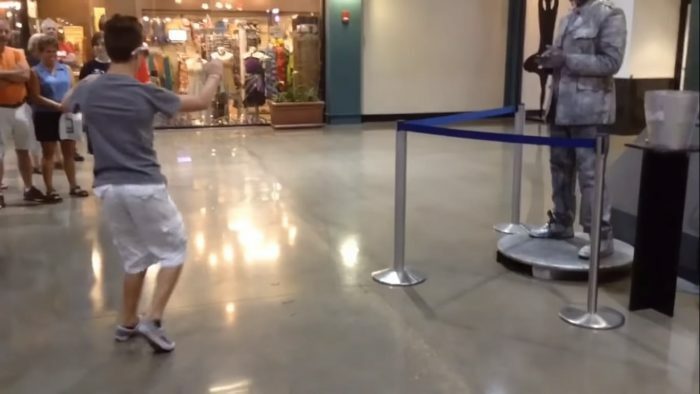 The patrons at this shopping mall were in for a treat when Noster and one of The Millennium Robots decided to throw down and see who was the better dancer. Noster uploaded the video to YouTube in which he and The Millenium Robot member Eclypse begin dancing to a Skrillex remix. Noster steps back and the challenge is underway, as the teen mimicks the human statue’s robotic performance. Things take off from there as a crowd gathers to watch. The two start slowly but build on their moves as the dance-off progresses. After the statue has shaken off his creaky moves, he breaks out in perfect rhythm to the beat. Eclypse, despite being robotic, can move so fast and smoothly, all while atop his platform – it’s remarkable, really. But who won the battle? Both of the YouTubers turned out to be big winners in the viral video game, as millions have viewed this video and both Noster and The Millennium Robots’s channels have even more dance battle videos. 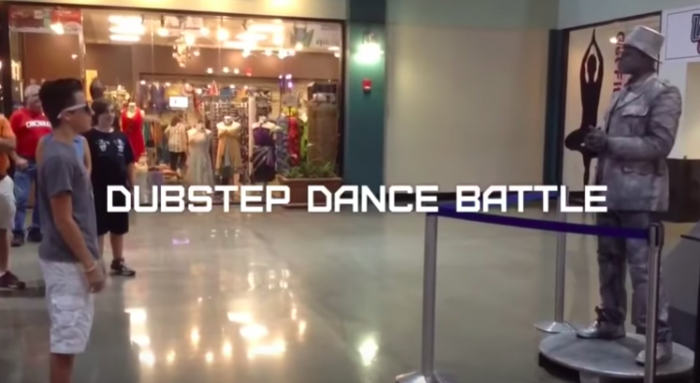 In another video, Noster and Eclypse dance to another Skirllex remix in a busy shopping area. Again, viewers were won over by the dubstep dance battle. Other videos on Millenium Robot’s channel include a dance routine to a song by DJ Snake and Lil Jon, which features two statues in a dance off against each other in front of a movie theater. If you’re looking to catch one of these battles in person, one will be coming to Phoenix, Arizona at the World Hip Hop Dance Competition held in August 2019. Among the many comments left on this dance-battle video were those who believed that Noster did a good job, but the human statue bested him. Over the weekend, I was talking to my wife about seat belts. Sometimes people don’t like to wear them when they’re sitting in the back seat. But I prefer when people do. My reason? While I may be a decent driver, I cannot protect the passengers in my car from other people on the road who might be texting while driving or driving while under the influence of drugs or alcohol. Seat belts might not be perfect, but they certainly do help save lives. Buckle up, even when you’re in the back seat, and you’re increasing your chances of surviving a crash. When it comes to other people on the road, we really don’t know who we’re dealing with. And now police have come forward to issue a terrifying warning. 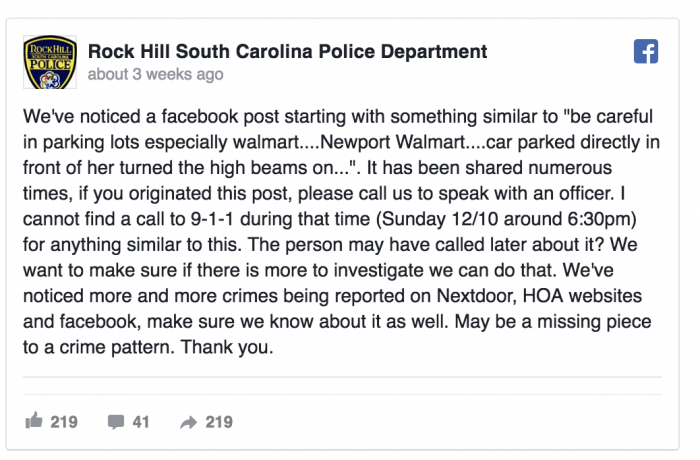 It comes after a victim in Rock Hill, South Carolina found herself in a terrible situation. Two men drove right in front of her and blasted their high beams at her. That’s when all hell broke loose. The high beams blinded the woman. And the men left their car and started to pry her door open. Thankfully, the would-be victim was able to drive off and get to safety. But she was left horrified about what could have happened. Because the woman is still afraid for her life, she wanted to share her message, but she didn’t want her identity to be known. A friend spoke to NBC Charlotte on her behalf. The woman suspects that the would-be assailants are still on the lookout for her. Thankfully the victim had her doors locked. If she had forgotten this simple safety trick, the men would have been in the car and all over her and her possessions. She still does not know if they were there for her car, her possessions, or something more valuable than all of that – her life. “Who knows what would’ve happened if they had gotten her car and she didn’t lock the doors?” the friend said. The woman did not call the police. 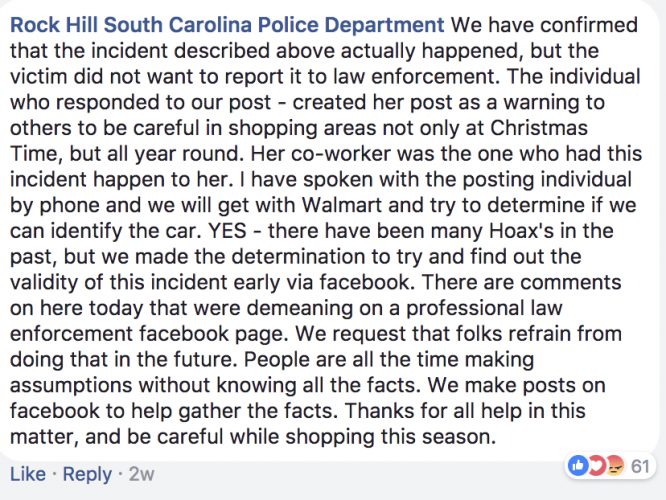 But she told her friends about it and the Rock Hill South Carolina Police Department was horrified to hear this happened right under their nose. They launched an investigation after the story went viral. Operating a drone can be a magnificent way to get to know your neighborhood. You get to fly around and take personalized tours beyond what the features in Google Maps can give you. 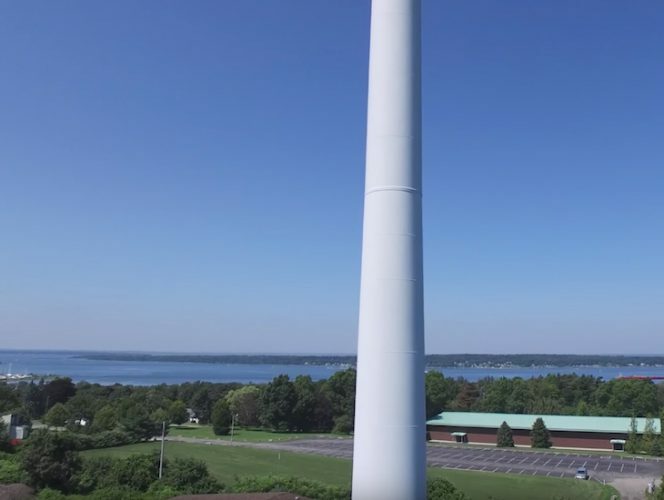 You can lift up so high that you can see the tops of buildings, the tallest trees, and if you’re in the right areas, the tops of wind turbines too. But be careful of what you might see up there. Recently, a man shared his video of one of the most bizarre views I’ve ever seen. After it was shared at DailyPicksandFlicks on Youtube, it garnered over 3 million views in a brief period of time. Once you take a peek at the weird thing he saw up there, you’ll probably be surprised it doesn’t have more. Wind Turbines can often be found in fairly rural areas, where a company is converting the wind’s kinetic energy into electrical energy. It’s hard to find them in high populated areas, as these things are a force to be reckoned with—often over 200 feet tall with a pretty wide girth as well. That’s probably why the cameraman wanted to see the top of a wind turbine when he discovered it. Well, it was that and that the turbine’s door on the ground level was open. 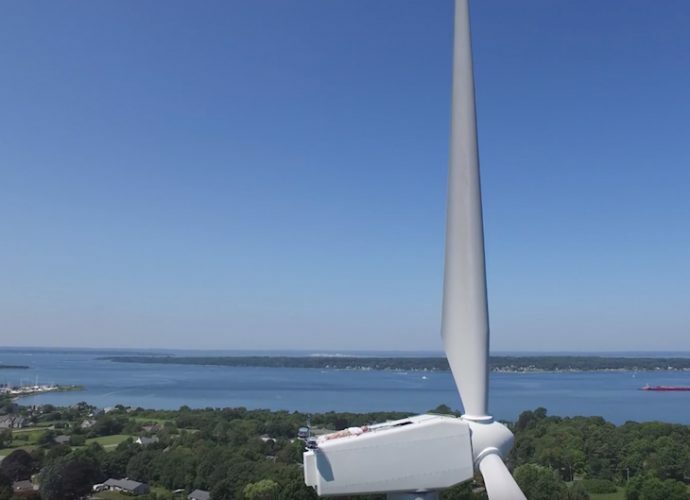 Since he didn’t see anyone working around the area, he decided to fly the drone up to the top of the turbine and see if he can figure out why the door was open. You know what he saw? A bald man wearing a white t-shirt and cargo shorts lied on his back on top of the wind turbine, just sunbathing away! It was clear that he wasn’t doing any work up there (both from his relaxed clothes and from his relaxed posture) and instead, he was just doing a little chilling out. What else could be more calming than lying on your back on top of a wind turbine? It’s not like anything could go wrong up there, right? 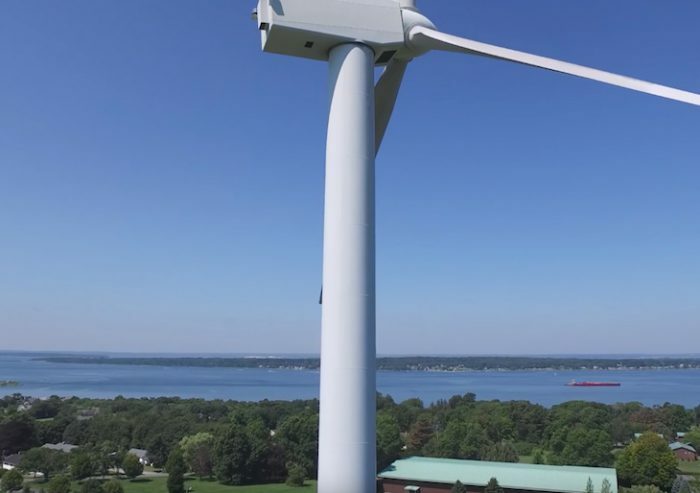 Once the man on top of the turbine recognized that the operator of the drone was staring at him, the man leaned up and gave the camera a nice little wave. But after a few minutes, he got a little less friendly. 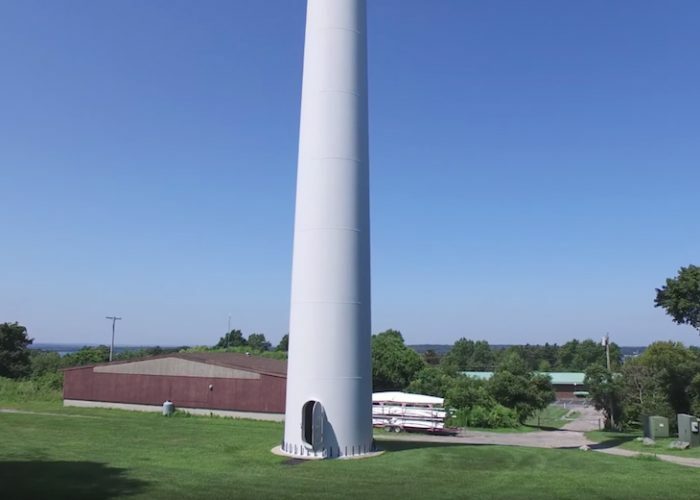 That might be why everybody loved the video so much because it seemed like the man on the turbine felt angry that his peace and quiet was being interrupted. I could only imagine what made this man try to relax up here in the first place. And also, has he done this before? Does anybody even know this man, or was he just in the right place at the right time for some good old-fashioned sunbathing? So many questions, so little answers. But at least we’ve got our imaginations to fill in the blanks. Who do you think this man was? How often do you think he comes up here? And would you consider lying on top of a wind turbine where a fall means certain death? More and more we are seeing that dogs (and some cats) are being used as therapy dogs in hospitals and nursing homes. Why? Because animals can bring comfort to those who are living in pain or are in the hospital. Besides, most dogs love attention anyway, and the people they visit are willing to shower them with love! Nala, a teacup poodle, lives in Minnesota and goes to work every day with her owner Doug Dawson. Dawson works at Lyngblomsten nursing home. While Dawson does his work – Nala does hers. Nala is not a trained therapy dog – but, she doesn’t let that stop her from dispensing some of her own therapy! Watch the video and see Nala in action. Who wouldn’t smile to see this little dog jump on their lap and cuddle? Roberta’s daughter was extremely worried when her mother didn’t return home after taking one of her walks. The 81-year-old great-grandmother lives with family up to three generations after her in Maryland, and she has dementia though she maintains a relatively active life. Usually, Roberta goes for walks on her own and comes home just fine, but this time, she didn’t. Concerned, Roberta’s daughter rang up the Charles County sheriff’s office and told them what happened. Five officers hurried out to find her, and they spent a good forty minutes calling her name as they clambered through a wooded location. Finally, they heard her call back in response. The officers rushed towards her and saw that she was walking calming along a small path nearby. She seemed very confused as officers removed some branches that had gotten stuck in her hair. They realized, then, that they did not want to embarrass her by telling her what happened. So they said they happened to also be on a walk and offered to help her get home. 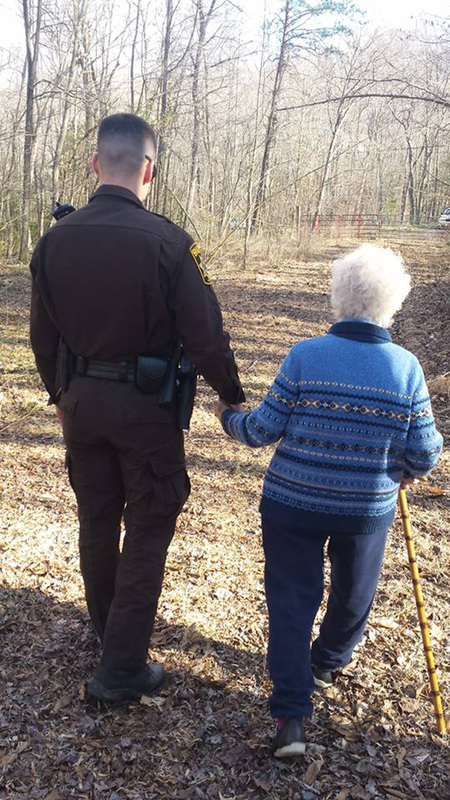 Officer Morrison, one of them, felt particularly connected to Roberta, as he himself is very close with his own grandmother and couldn’t help feeling intrigued by all her wisdom and experiences. When Roberta got home safely, her entire family – from her daughter all the way to her great-granddaughter – were beyond thrilled that she was okay. Roberta, on the other hand, didn’t see what all the fuss was about. 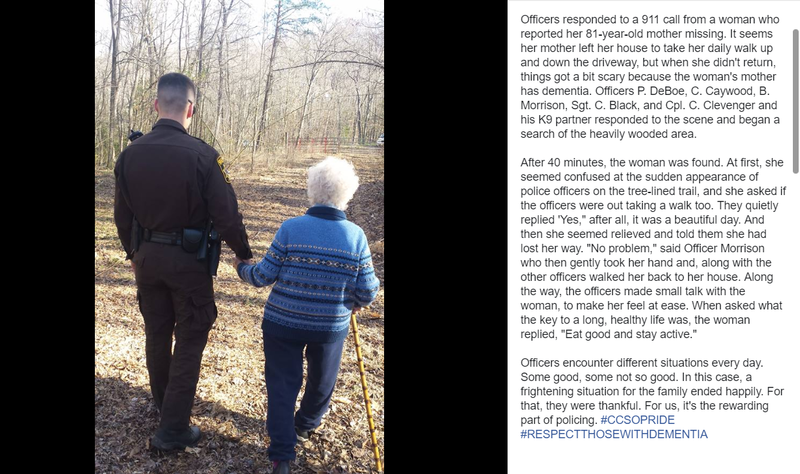 She said she was fine and told her daughter that all she did was go for a nice walk with the kind officers. Officer Morrison also was in a picture standing next to Roberta as they held hands and walked earlier. The photo was taken by Sergeant Black, who was very happy to have taken it and thinks it’s quite a nice picture. The 60-year age difference between the photo’s subjects makes it all the more interesting. 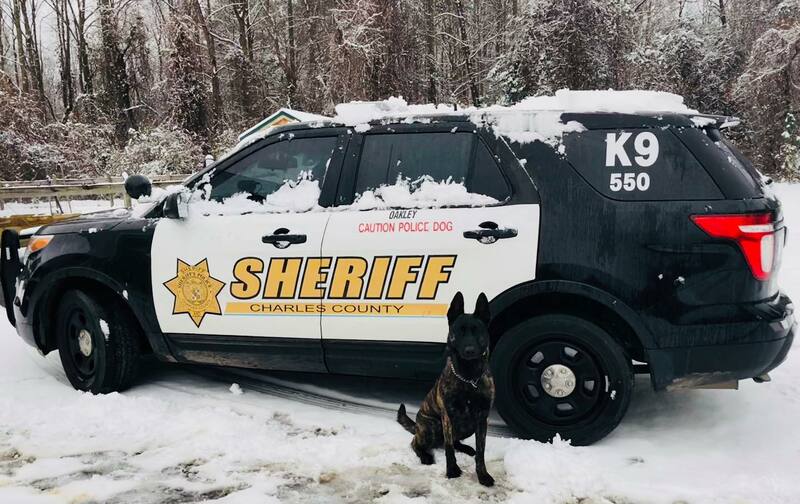 The Charles County sheriff’s office decided to share the picture, and a short version of the story, on their Facebook page. The status mentioned that police officers face various situations every day, and not all of them end well, so this happy ending for such a scary situation was more than welcome for these officers. They talked about how grateful they were to have found Roberta in one piece. This post has since earned more than 222,000 likes, with shares and comments abound! It is definitely true that the police deal with countless difficult cases on a daily basis. It’s rewarding for them to be able to do something like this that has such a wholesome, happy ending. The fact that these kind officers were also so careful, thoughtful, and sweet to Roberta makes it all the more enjoyable for us to hear about. A Gaza zoo has gone to extreme measures in order to encourage locals to visit the struggling business. A young lioness was declawed with the intention of having visitors play with the 14-month-old cub. Animal activists around the world are outraged with this decision. The act of removing a lion’s claws has been compared to cutting off a human finger up until the knuckle. The Rafah Zoo is located in the southern portion of the Gaza Strip near the border with Egypt. In a desperate attempt to generate business, the owner of the zoo decided to make their 14-month-old lioness more safe for human contact. The gruesome decision was carried out two weeks ago at the zoo. While a procedure of this magnitude should take place in the proper facilities, the Rafah Zoo didn’t have enough funding to foot the bill. Instead, the zoo owner decided to have the procedure performed in the dirty zoo. The lioness was called Falestine after the country of Palestine in which Gaza resides. Falestine was put to sleep with a tranquilizer and shrouded in a thick blanket. She was lifted onto a table to provide the veterinarian quicker access. Fayez al-Haddad used a pair of shears to cut off the lioness’ claws. Although he took the time to sew up each wound, the entire procedure was inhumane and sloppy. Unfortunately for Falestine, the procedure required more than one operation. She was put under once again on Tuesday so the veterinarian could finish the job. It’s difficult to imagine the amount of pain caused by this procedure. The 14-month-old lioness must have been completely confused after realizing that her paws were missing. The Four Paws organization compares the procedure to the cutting of a human’s finger up until their knuckle. The owner of the zoo doesn’t seem to be morally affected by the cruel decision. It is clear that animal welfare is not high on the list of priorities for the Rafah Zoo. The zoo opened nearly two decades ago. Despite having twenty-years of experience in zoo management, the decision to cut off a young lioness’ claws was still made. This is a chilling and concerning issue that calls into question the treatment of other animals in the zoo. Unfortunately, destruction and death aren’t unfamiliar faces at the Rafah Zoo. The zoo had to close its doors in 2004 after an Israeli army operation bulldozed parts of the structure. Before that incident, many animals lost their lives due to rockets that were being sent from Israel. 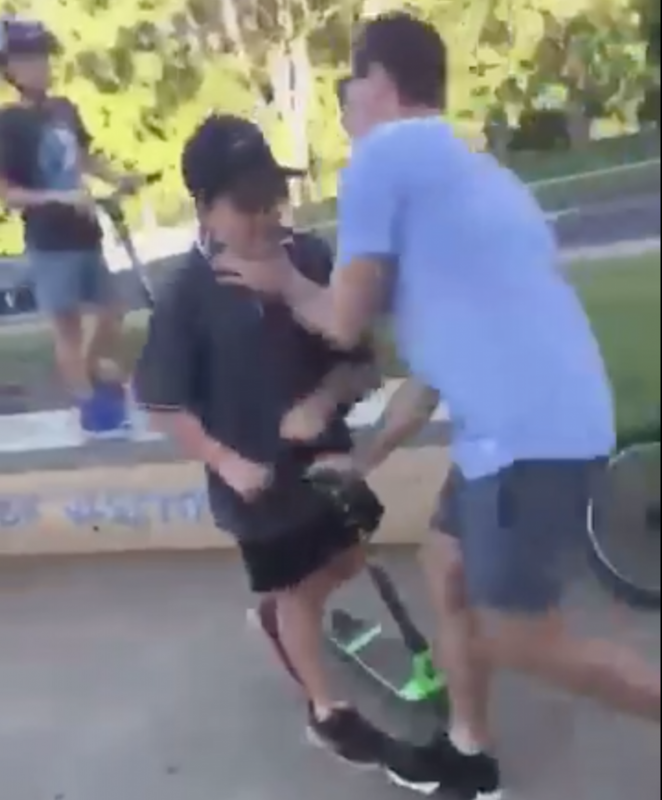 In dramatic video footage posted to Facebook, an unknown man can be seen physically assaulting a couple of children at a skate park. The assault is believed to be the man’s response to his child being bullying. Authorities are still investigating the incident. They’re asking anyone with any information to come forward immediately. A middle-aged man with dark hair and wearing sunglasses was sitting on a wall at a skate park in Goonellabah, near Lismore, on the NSW North Coast. He sits beside a child thought to be his son. One of the dozens of preteen boys skating, biking, and standing nearby says something, presumably to the man or the child beside him. It’s unclear what was said, however. In response, the man is seen jumping up and placing one hand against the throat of a child riding a black and green scooter. He wrestles the scooter away from the child. He can then be seen rushing up to another child on a scooter and using the apprehended green scooter to push that child off into one of the skatepark’s deep skating bowls. The man tosses the green scooter off in one direction and the fallen boy’s scooter off in the opposite direction. The video cuts as the man appears to be continuing to go after the boy he had pushed into the bowl. The video of the attack was posted to a local community group’s Facebook page. The incident was also reported to the Richmond Police District. So far, authorities have been told that a group of 12-year-old boys had verbally abused, threatened, and chased away another boy that Sunday afternoon at the skatepark. When the boy returned the same day with the man in the video, who’s presumed to be his dad, the group of bullies continued to taunt the boy. The man responded with the physical attack seen in the video. Crime Stoppers is urging anyone with information about the incident or who can identify the man in the video to contact them or the Richmond Police District immediately. 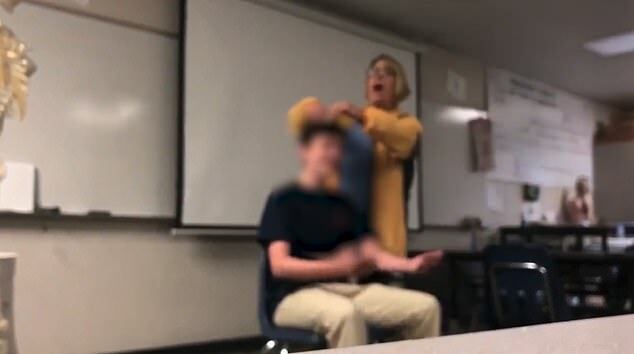 A teacher named Margaret Geiszinger is in trouble after she decided that she wanted to make an example out of one of her students. The students had reportedly been bringing their cell phones to class and acting up. 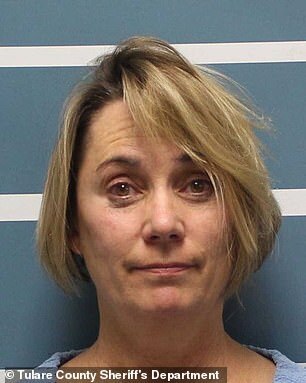 After she cut the boy’s hair, she targeted a female student. She also chased students with a pair of scissors in her hand. The students screamed in fear. The students said that the teacher came into the classroom with a pair of scissors and told them that it was haircut day. One student described the incident to KFSN. They stated that the teacher thought that the incident was funny. The teacher said that she was joking when she said that she was going to cut the boy’s hair. However, she really did cut his hair. The student, whose name has not been revealed, stated that they were frightened by the incident. They ran out of the classroom and went to the principal’s office. They stated that they hope they never see her again. They also said that they will never respect her as an authority figure. The entire incident was caught on video. The College of Sequoias intervened when they saw the video. Margaret was arrested for the incident. She is being charged with child endangerment. Her bond is $100,000. Kevin Mizner is the police chief. 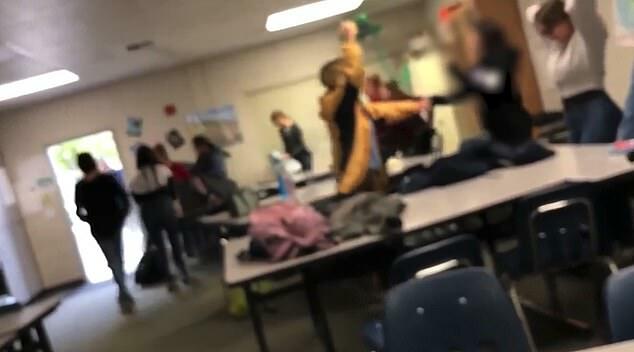 He stated that this is just one of the many strange incidents that has occurred at the University Preparatory High School, which is located in Visalia, California. The school has stated that the teacher will not be returning. If she is convicted of the charges, then she can spend three years and six months in jail. The teacher has commented on the incident. He stated that he is shocked and confused by the incident. He also said that his wife’s behavior is out of character. When the weather starts to get cold, gone are the days where you can just hop into your vehicle and take off. Many mornings, you have to warm up your vehicle and let the defroster run so that you are able to see out of your windows. This can take time, especially when the temperatures dip below zero. If your vehicle is covered in ice or snow, getting ready for the morning commute can become an even more tedious experience. However, with a sock and a little creativity and information, you can stop those foggy windows so that you are ready to roll as soon as you buckle your seat belt. To get started with this incredibly smart idea, you will need an old sock that is clean and free from holes and structural issues so that the litter is not able to leak out. You also need cat litter and masking tape. It is recommended that you use a low-odor or no-odor cat litter just so that your vehicle’s cabin does not smell like litter. Fill the foot part of the sock with the litter and then use your tape to secure the open ends of the sock that you are using. It is a good ideal to use a smaller tube sock for this so that you can put in adequate litter and still have plenty of room at the end to tie it off securely so that the litter is not able to spill. Once you create your litter-filled sock, simply put it on your dashboard when you are parked. You might also consider creating one to put in the back window too since this can also get really foggy on those cold days. And, this is it. You will come out in the morning and not have to worry about eliminating fog before leaving your driveway. So, why does this work? Kitty litter is exceptional when it comes to absorbing moisture. If you have a car, you are surely aware of how effective in can be. Condensation on your vehicle’s windows is the result of moisture getting trapped in the air inside the cabin of your vehicle. The kitty works to essentially leech this moisture from the air, reducing its level enough to where it is unable to cause condensation to happen on your windows. The sock simply works to keep the litter from getting all over your car. Condensation in the cold months is common because the inside cabin temperature is higher than the outside temperature. You often see this in reverse when you grab a cold glass of ice water on a hot summer day. You notice the condensation on the outside of the glass because of the external temperature being higher than the ice water that is inside. This certainly seems like a quick and easy way to make your mornings a bit faster and more pleasant once Old Man Winter makes his appearance. Are you going to grab a sock and some kitty litter and try this for yourself?